The Sataoa Primary School grounds was a buzz with rugby league action during the weekend. 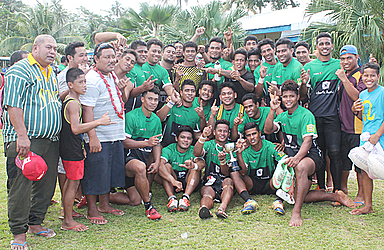 The grand final of the Matson Toa Gas Championship saw the Siumu/Mulivai Eels, the winner of last years completion play Lotofaga/Sataoa/Saanapu Cowboys. The game was intense and very physical with a strong turnout of supporters for both teams. In the end, the Eels won 14-12. The R.L.S organising committee was very happy with the turnout and saw many potential players for Toa Residents for the upcoming game against Tonga in Hawaii next month. Rugby League SAFATA-LEFAGA MATSON TOA GAS (5 week) competition played at Sataoa Primary School. The player of the match was awarded to Leia Saofaiga captain of the Siumu/Mulivai Eels.